Fiberglass is one of the most commonly used materials for insulating the home. It is an effective barrier to the passage of heat. In hot climates, it prevents heat from outside the house entering, reducing the need to use air conditioners. In colder climes, it preserves the interior heat generated by the furnace. In both cases, installing fiberglass insulation can help reduce energy bills. However, there are restrictions to its use. Fiberglass insulation is commonly used in attics around the chimney stack. Fiberglass is melted glass that is spun to make it fibrous and then combined with plastic polymers. Fiberglass insulation normally comes in the form of batts or blankets. These are strips of the material that are cut to length for installation by being stapled to the ceiling of a basement or the floor of an attic and by being affixed around fittings such as pipe work and chimneys. Fiberglass insulation may also be fabricated in rigid boards or as a loose-fill blown-in substance that is sprayed into cavity walls, where it hardens. Fiberglass insulation is naturally fire-resistant. This makes it an ideal insulation material for use in areas that experience high temperatures. As such, it can be used to insulate a chimney. It is often installed in gaps around the chimney and flue to prevent airflow that can siphon the heat away from the interior of the building. Fiberglass will not burn, but it may melt if temperatures exceed 212 degrees Fahrenheit. Some fiberglass batts come backed and/or faced with kraft paper or foil. These facings are applied to act as vapor and insect barriers. Batts with such facings must not be used to insulate chimneys as they are combustible. They will readily burn and may cause a fire to spread. For the same reason, faced batts should not cover electrical wiring or heating pipes. 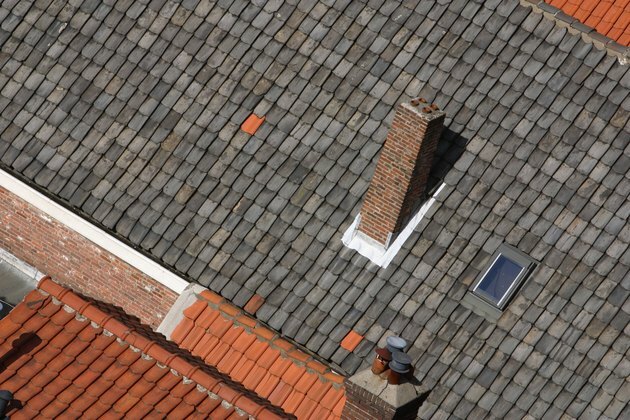 Despite the fact that it may melt at higher temperatures, fiberglass remains a good choice for insulating a chimney. This is primarily because of its flameproof nature. Cellulose insulation is flammable, while many foam insulations can emit chemical vapors if exposed to temperatures that cause them to smolder.